A large beautifully coloured bird, it is about 43cm in length and the male in full colour is a brilliant rich crimson all over the head, neck, chest and under parts. They live in the timbered areas of the Great Dividing Range from North Queensland right along the East Coast to Melbourne.In many centres they have become quite tame and are fed by the locals with fruit and seed. They are popular visitors to many Parks and country guesthouses. They found in the higher mountainous regions including the Blue Mountains and in most Mountain Ranges along the Australian East Coast. They eat a wide range of seeds, nuts and fruit from the Acacia range of Wattles to berries and blossom and also in insects and grubs. In captivity they have a basic seed diet, but corn, apples and pears and almost any fruit are enjoyed. They need a large aviary for free flying an activity or else they are prone to overeat and become fat and lazy. Getting a compatible breeding pair is not easy but once they accept each other and go to nest they develop into excellent breeders. They prefer long hollow logs but a deep nest box is also suitable. Sometimes they even lay on the ground. Four eggs are usual, taking 20 to 21 days to hatch and another 7 weeks to fledge. Young are best left with their parents for several months. They nest in late spring usually September to January. 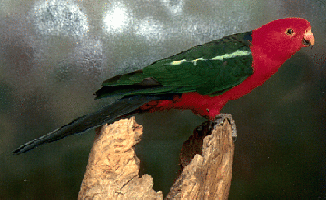 King Parrots are not aggressive or flighty and make friendly and affectionate pets, although not strong talkers but their beauty is their biggest asset. Being a mountain bird they love fresh water and their drinking dish should always be clean. It is very important they have a large aviary and get plenty of flying exercise. This will keep them healthy and attractive.